It aroused a huge interest when we saw the performance of Laurent Coulondre. He controls multiple keyboards proficiently on the stage, which makes listeners feel like falling in a Jazz maze that Laurent builts. Also, he has been trying to cooperate with other musicians and choose different forms of performance to create and perform. Last year, Laurent released the album Gravity Zero cooperated with 4 drummers and performed by using the form of a duo. In this album, each note is full of avant-garde when he hits the keys to make music.Gravity Zero is not only a name of the album, but also a music project belongs to him. We talked to this Jazz artist with a big curiosity to both Laurent Coulondre and his music. In the conversation, Laurent talked about his attitude towards Jazz music and what he wanted to express through the music. Before his first China tour Gravity Zero with Yoann Serra in April, let’s get to know about him from various angles.Q：Is Jazz music the first genre that you began to know about music? Or other words to say, how were you brought into contact with Jazz music? When did you begin to create Jazz music? A：Yes, as funny and unusual it is I began music with jazz! Exactly I can say I begin music with improvisation! My first instrument was the drums and I start at 3 years. Also I was lucky because in my little town it was festival, workshop and big band of jazz! I made my first concerts when I was 12 years old opening for Al Jarreau, Marcus Miller, Dee Dee Bridgwater… It such a good experience to start! Q：I found that you prefer to play multiple keyboards in the performance. Do you have any experience of playing keyboards of Jazz music to share with people? A：You mean if I have an « anecdote » of a concert? I start with piano but I discover Organ and Keyboards more later and I would consider my difference a force. There is a lot of pianist and also a lot of keyboardist, less organist. I want to make my difference because I can play all of them and by the same time doing a « new » music, my own music, and I try to express this with a lot of groove and big sounds. I have one anecdote 12 years ago, I was playing for a singer in a « bodega » in south of France, and he just forget to mention that there are 2 girls who gone dance (half-naked) with us… The concert was okay and the people happy but 2 months later I go to have my exam (BAC) and one of this 2 girls was my test supervisor… Imagine that! Q：Which kind of reasons that drive you to cooperate with different musicians all the time whether you create or perform the music? A：That is one simple reason, when you play with different musicians you can learn and receive different vibes. This is how you can build your own « vibes ». It’s not really possible alone… You need to have interference and connexion with other musicians to create a music you want to be sharing with people. Q：Who is the Jazz master that you really want to work with and perform together? A：There is a lot! Live or dead ? I think I would love to play with Herbie Hancock, Wayne Shorter, Roy Haynes also « young cats » like Brian Blade, Marcus Gilmore, Chris Potter, … And I would love to meet Michel Petrucciani ! Q：I know that there were 4 drummers played on the album “Gravity Zero” and Yoann Serra was chosen to work with you in the tour. So how is your feeling when you play with Yoann Serra? And how you think about this partner? Q：Could you please explain the meaning of the album cover that you are trying to express? A：We choose the cover, first because I was seduced by the work of « Mezzo ». Gravity Zero is an album of duo and I think we you see the cover it’s about lunar things and when you see the animals, also there are only two. With bright color like my music with contrast and energy ! I think there is this electro/electric ambiant too. What do you think? Q：What will you expect the listeners could feel from album “Gravity Zero”? A：FUN！As we say in french « KIFF » ! Q：We heard that “Gravity Zero” is not only an album, but also a music project. Could you talk about this project? A：I choose the duo format because he allows me to play the bass and to directly connect with groove (drums). I really love to be directly connected to my drummer because when you play a trio there is bassist between the keys and drums. I think this is an original format and it’s the best way for me to express my love of Keyboards ! Q：I saw there were some contents about the Chinese tour that you posted on facebook a few days ago. So what’s your expectation about the tour? A：Hey it’s my first time in China ! I’m so excited to come and meet new people, new community and to have the chance to share my music in this amazing country! Also we’re trying to make a few touristic things and discover all the incredible of China. I hope Chinese people are going to like my music, maybe dance on my music ? And more later we maybe can come back again ! Q：I also noticed there is a poster on the facebook which is designed for the Chinse tour by yourself. I was wondering about the inspiration of this poster? Is that from the flag of China? A：Yes it is ! We manage with my community manager to find something between gravity zero and China, to mix up. 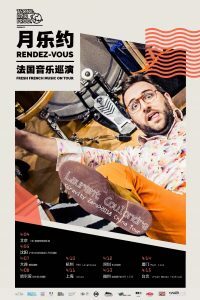 Q：We know that, each month there will be a French Jazz musician to perform in China through the project “ Rendez Vous ”. Being the first musician to perform this year, what do you think about the meaning of “Rendez Vous” as a long-term musical project? A：It’s amazing ! It permits to French Jazz musician to express his music and to share in the other part of the world ! I hope it’s a very good initiative ! And maybe in the future we can think to make meeting with Chinese musicians and Chinese culture to mix our countries. Q：Here is the last question, what does Jazz music mean to you? A：I think it means a lot of things and he is really a big big part of my life and my reason of live ! Also it’s my way to try to make some love and happiness to the people and it’s very important in this world ! RENDEZ-VOUS Fresh French music ON TOUR is supported by the French Embassy in China and the French Institute – Paris, which will give monthly performances of French Jazz or World Music musicians in some theatres and clubs in China. This project enhances the cultural exchange between China and France. At the same time, it helps French musicians and artists to attract more amateurs and also increase their audience in China.